It is so amazing how the Lord brings forth divine appointments in the most unexpected places that blow your mind and go beyond your expectations. A couple days later out of nowhere he sent us a little letter saying he thought Patrick should have a better bike for these long bike rides with a gift to go along with it. Well, that was an answer to a long-standing prayer of ours and of course Patrick’s. 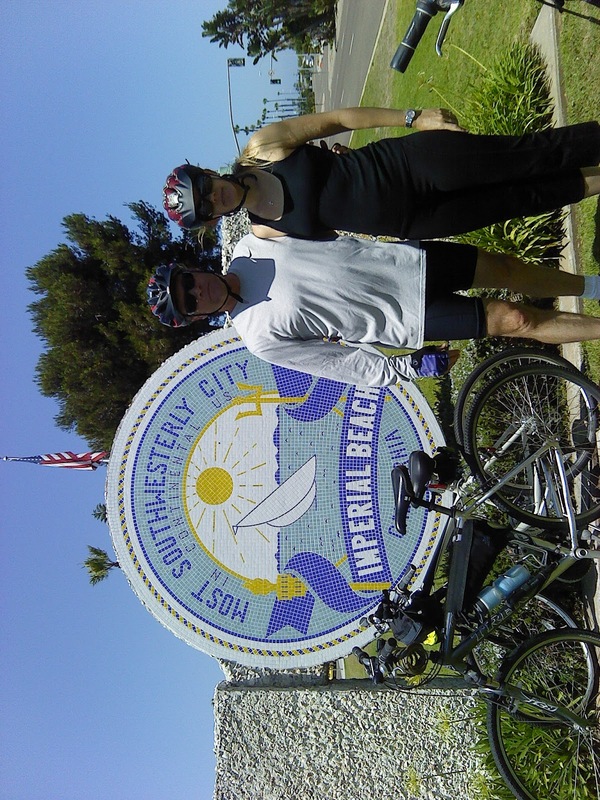 So with a new bike ready to go we felt led that it was time to do a ride we haven’t done in about 5 years which was to bike down to the very tip of the southwest corner of the US—to Imperial Beach—the farthest southwest point you can go in the US. So we hit the road, actually bike trails, and with a stop at our parent’s to stay the night on the way we ventured towards our destination. 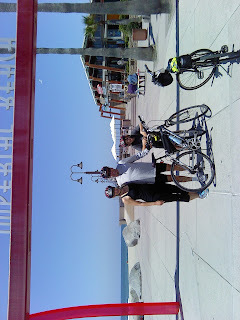 72.5 miles later we were making our way there, but biking is a bit like going on a boat, there are a lot of variables that can affect when you get there, and it was in fact the ferry boat from San Diego to Coronado Island that delayed us about an hour, causing us to arrive in Imperial beach in the night time hours. With it being summer and all and the crowds that go along with it we ended up not finding a place to stay in a normal location. In fact we were in Imperial Beach riding around looking for the place, which was turning out to be nowhere near the beach at all but way up inland. So, as we headed further and further up inland into some sketchy areas, I told everybody we best keep our voices down and just move fast and just get there. We finally arrived and I was thinking, “Well, you never know what God might do on one of these trips,” as I was sensing the Holy Spirit preparing something on the way. The next morning we went to grab some of the stuff they call breakfast at these motels they allegedly “give” you with your room. There was no place to sit but a young woman started waving us over to her table, indicating that she’d share her table with us. I was a little apprehensive, hoping she wasn’t wanting to sell us some Amway stuff or something, but God opened up a divine-centered conversation right away with her. After we finished praying and ministering to her, she gave us a big hug and said she had come down herself from LA and was just praying and seeking God and wondering what she was doing at this strange motel in this area. She felt that this was the answer for her little trip and that God was speaking to her through this divine appointment about her next steps in life as she was in a point of transition. “Wow, only the Lord can coordinate stuff like this on both ends,” I said. We just sat there a while rolling in the glory of God and enjoying the moment of such an amazing divine appointment. 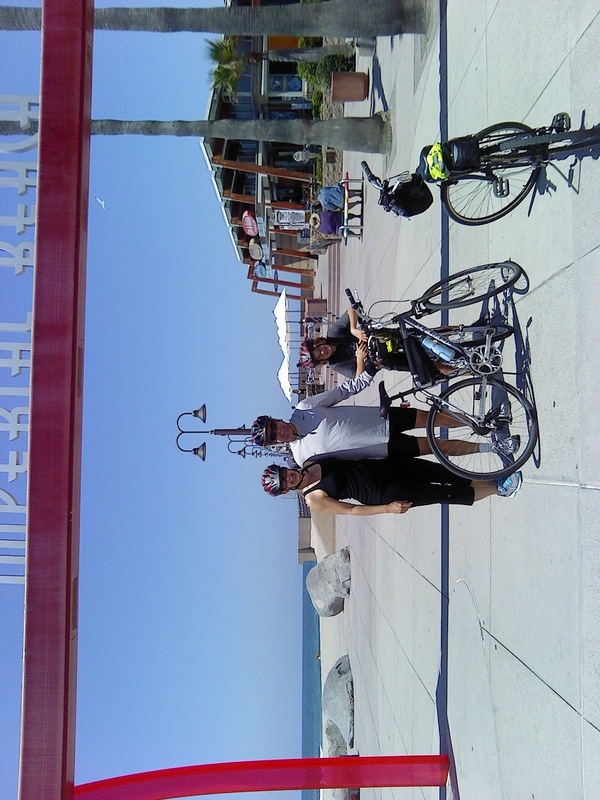 When we finally said good-bye and took off, we rode through the actual beach area of Imperial beach which has been fixed up nicely as of late from its former run-down state. I stopped in front of a little surf shop where I remembered speaking at a surfer’s bible study years back, which came through a divine appointment and divine connection as well. Now we just gotta pedal the 72.5 miles back!!! But the glory of God sure got the attention off those sore legs, Hallelujah!! !